The first obvious change is Knuckles. Oh boy, has he ever changed! The first preview image I saw of this was with all the characters in shadow, and I originally thought that Knuckles was missing and they had included Werewolf Sonic (from that 2008 title ‘Sonic Unleashed’… which we may never again speak of…). But no, this extremely tall muscle-bound hulk was Knuckles, and this is where the title of this post comes in. This was the first reaction-image I found (via Tumblr), and it pretty much hit the spot for me. What a shock! And while these theories on Reddit confirm many things the producer of Sonic Boom has said in interviews, it also highlighted a further inconsistency with one aspect of the re-design which this article also confirms. Amy is ‘coming out of her shell’ more with a more positive redesign, a better position in the game (she sort of occupies a tank role) and less reliance on Sonic, which is great when the producer says he wants to encourage more young girls into gaming (hooray!). But, in contrast with the giant hammer she wields, her movements are re-designed to be graceful, like a ballerina, and her gloves are less practical than the others’. Now, I’m a woman who often has to use a hammer in my line of work (geology) and I don’t envy the blisters she’ll be getting. 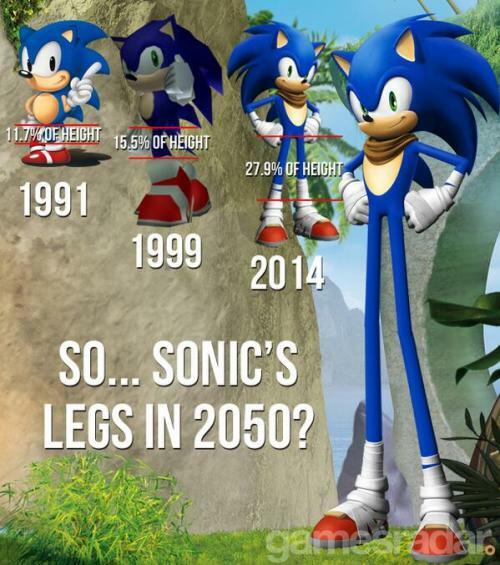 I mean, they had the decency to give Sonic sports tape for his aching feet! I will say one thing though, I am glad her redesign has made her more independent. Tails has probably done best out of the lot, with his aviation goggles and bag of tricks. Not a lot left to say there really – Tails started out with a sub-standard design in the videogame Sonic 2 and the animation Adventures of Sonic The Hedgehog, in 1992 and 1993 respectively, and since then his design has just been getting better and better. However, despite the confusion and hilarity, you might want to watch the GamerFitNation interview with Stephen Frost, producer for Sonic Boom. It is enough to make me excited about the upcoming game and cartoon. It is great to hear there will be crossover between videogame and cartoon series, something the Sonic series has always been good at. And some of the preview scenes hark back to some of the settings and feels that made the Sonic Adventure series so successful. Obviously, this still has to undergo the acid test of actual playthrough, as it might turn out to be another let-down. Diehard Sonic fans have had their mettle tested ever since the Dreamcast’s fall. We continually hope that just maybe, something will come along that is on par with the Adventure series, and maybe even before that, to the days of the Megadrive. A character redesign is a very dividing issue, but I also remember my first foray into the Sonic fandom – at the point where the first Adventure re-designs came along – and I remember how many folk preferred Freedom Fighter Sonic and wanted to keep him that way. And how vehemently I disagreed at first, before settling down and getting into the old comics and games. I still hold a soft spot for the Adventure series designs, though. Sonic and his friends have already gone through so many changes, and I wonder if it is a bit like the Doctor Who saying – your first Doctor is always your favourite. My first Sonic is definitely my favourite, and perhaps it will be that way for the kids getting into it now? Still, I wonder if I will ever get over the fact that Knuckles has fingers now. That, to me, is just plain strange. This news piece was posted in Games and tagged Knuckles, Sega, Sonic. Bookmark the permalink. I simply want to tell you that I am newbie to blogging and actually liked this web site. Most likely I’m planning to bookmark your site . You actually come with outstanding article content. Bless you for sharing your web site.